"Tacos meat and fillings meet packaged crescent rolls for an easy dinner that your whole family will love. Serve with shredded lettuce, salsa, cheese, and sour cream." Preheat oven to 350 degrees F (175 degrees C). Prepare a large deep-dish pie pan with cooking spray. Heat a large skillet over medium-high heat. Break ground beef into small pieces and add to hot skillet; cook and stir until the beef is crumbly and no longer pink, 7 to 10 minutes. Drain and discard any excess grease. Season drained beef with taco seasoning. Press refrigerated dough into the bottom of the prepared pan. Spread refried beans in an even layer onto the dough. Spread sour cream into a layer atop the refried beans. 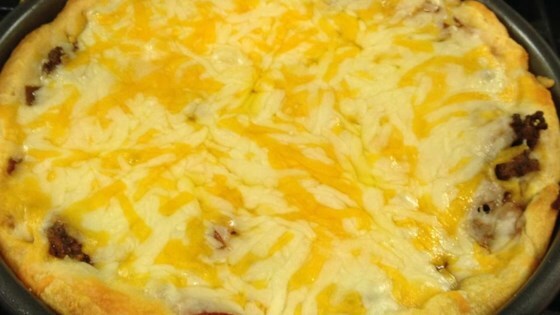 Sprinkle ground beef evenly over the sour cream; top with salsa and Cheddar cheese. Bake in the preheated oven until cheese is melted and bubbly and crust has browned, 25 to 30 minutes. Im going to try. The ingredients seem like a tasty combination. Ill keep you posted.. This was a great recipe! I added more vegetables for nutrition value. I cooked the ground meat with onions. Then I added an extra later of green and red peppers! My husband loved it! So easy too! My family loves this recipe! We add some crushed tortilla chips to the top for some extra crunch. Super easy and everyone loves it! Comes out perfect every time. I tried this a few nights ago, and i can't IMAGINE an easier recipe. My kids and husband loved it. Thank you for sharing such an amazingly easy and tasty recipe.